On the recommendation of our neighbours at Lawn Hill, we took the “easy” road to Kingfisher. After opening 11 gates and taking three and a half hours to do 140kms, we arrived without punctures and everything intact. 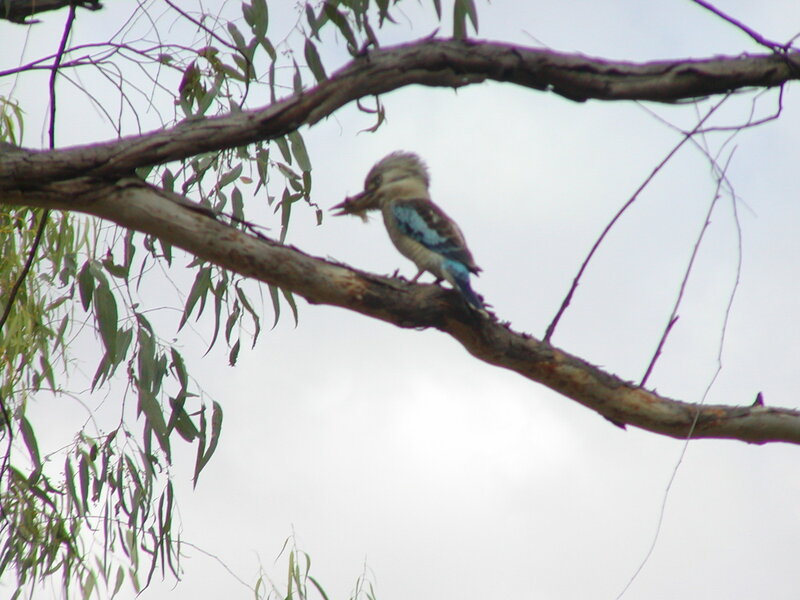 The camping area is treed with redgums, and has GREEN grass, with the river about 40 metres away. Lots of fresh water crocodiles, but the owners think it is safe to swim as they “haven’t seen a salty yet”. Made some pita bread, as supplies of bread are getting low. Russ is very happy with the way the solar panels are charging the van. I still have frozen meat, with a half-full frig of vegies, cheese, ham, salami, bacon and eggs. 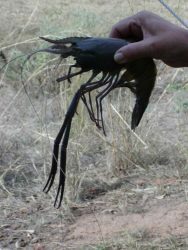 We bought a cray (or red claw) pot, so we’ll try our luck at catching some for dinner tomorrow. Tonight we are having Roast Lamb, as fires are allowed here. We found out today that Toni, the owner, will bake bread, so we put an order in for a loaf and four hours later, it was delivered to our camp, sliced and all! I checked the cray pot to find that I had caught a Cheriban, which is like a huge prawn, or small fresh water cray. It was 30cm long and 4.5cm wide – hope that’s legal, because it was in a pan of boiling salted water and 6 minutes later, waiting for us to eat it. It rained all night, much to the surprise of the locals and our road out has been closed, so we have to head north to Burketown (185kms). It was a better road than the Lawn Hill-Kingfisher road, except for a long stretch of muddy roadworks, when our tyres filled with mud and we slid over the first third of a causeway! Slightly unnerving to say the least!! 3 hours later, with everything covered in red mud, many inches thick. 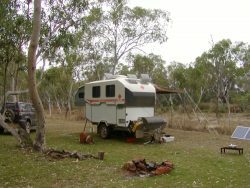 While travelling, we both had the great idea to have the car serviced there and my back seen to by a chiropractor (instead of Mt.Isa), only to find one service station, a post office/general store and a pub and caravan park!! The population is 235, height above sea level, 15m, (hope there are no tsunamis), Situated 1988km NW of Rockhampton, 1732km NW Brisbane, via Longreach. We’ll spend one night here, then have a long day tomorrow travelling to Mt Isa, via Gregory Downs.